I keep encountering an annoying error message as I try to set up my new 64-bit Vista laptop. Often when I try to install a program, I’m told that another installation is already in progress and I must complete that one first. But no other installation is in progress, and simply rebooting doesn’t help. I googled this problem, and found some complicated advice about failed installations and the Windows Installer Cleanup Utility. But I find that this error occurs when a program installs just fine in every respect except that it leaves the Windows Installer Service running. There’s a easy way to fix this. Right-click on the Computer icon, wherever it exists on your system, and select Manage. (I’m using the Classic Start menu, so the Computer icon is on my desktop. If you’re using the new Start menu, the icon is in the Start menu.) This opens the Computer Management utility. 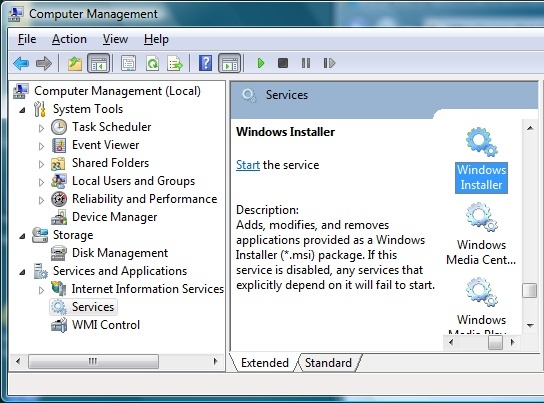 Select Services, right click on Windows Installer in the list and select Properties. 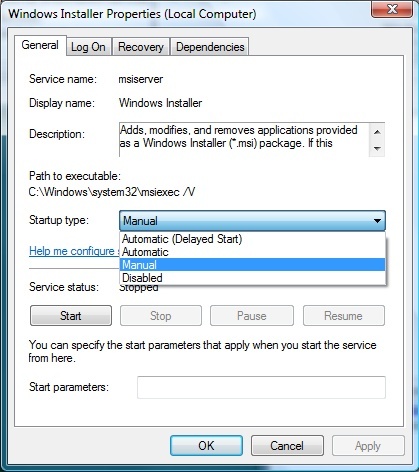 If you’re having the problem, the Windows Installer service is started, and the Stop button is disabled. Simply rebooting doesn’t stop the service. Here’s how you stop it. In the Properties dialog, change Startup type to “Disabled”, click OK, and reboot your computer. This stops the service. After your computer reboots, again open Computer Management (right-click on Computer and select Manage), open Windows Installer Properties, and change the Startup type back to Manual. Now you’re good to go and can start a new installation. @Sheryl : Thanks a ton for your assistance. I can’t do this, because my whole Windows Installer box is grayed out. I can’t get to the box to mark Disabled. The boxes on my computer are grayed out too. Nothing happens when I try to click on them to change it to disabled. Used this method twice now, worked a treat logged on with local admin rights (on Windows 7 trying to install Office2013 after just uninstalling Office2007 I got the error). Same as MTH all grayed out. Still grayed out as Admin in Windows 10. I don’t know if this will help, but for all those using above Windows 7, open the task manager (ctrl+shift+esc) and look for processes with the name “msiexec” in “Processes” &/or “Details” and end all of them. Then rerun your installation and it should run just fine. Same here, all grayed out!